With this initialling, the text is agreed upon. The next step is the formal signing of the agreement, after which it will be applied provisionally, before its ratification by the national parliaments. The details of the agreement were made public a month ago, according to which the three EEA EFTA States will contribute a total of EUR 9.6 million to Croatia to reduce economic and social disparities and to strengthen bilateral relations as part of the current EEA and Norway Grants scheme (under which projects may be implemented until 2016). For its part, the European Union has granted Iceland and Norway additional duty-free quotas on exports of fish and other marine products. 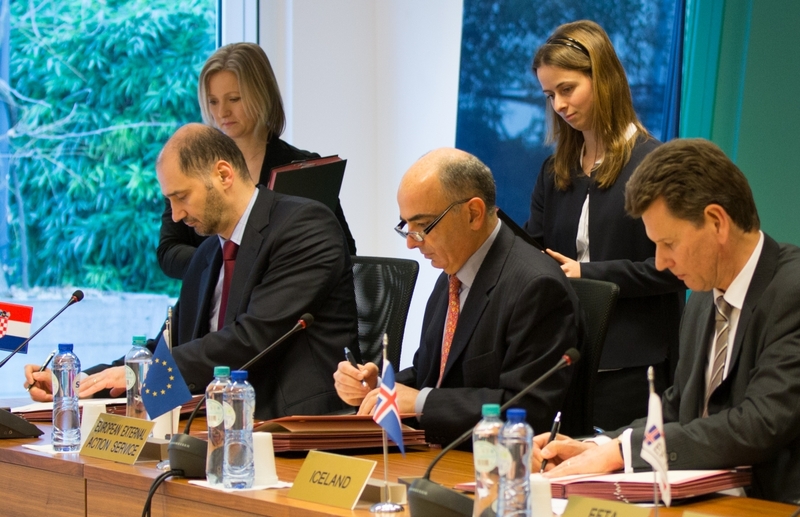 The agreement was initialled by Deputy Minister of Foreign and European Affairs Joško Klisović on behalf of the Republic of Croatia, the Ambassadors of the three EEA EFTA States - Iceland, Liechtenstein and Norway - and Head of Division Gianluca Grippa, on behalf of the EEAS.